Many many mahalos to Allan Seymour and his team, the guys and wahines from Quicksilver and the volunteers for this event. This was the first ever Stand Up Paddle Surf contest on the mainland. We had more than enough Stand Up Paddle Surfers show up and represent this segment of surfing. Packed heats proved that. It was a great turn out and good fun was had by all. The morning weather and waves we're not the best but we all had a blast and it turned into a beautiful beach day. The above pic is the top six and below are few of the first eliminated. The winner was not present for the pic nor was "Ester Williams", had to be there. Stay tuned for more. And get ready for the San Clemente Ocean Festival in July. 10k Stand Up Paddle Surf race! Labels: "Stand Up Paddle Surf Contest", "Stand Up Paddle Surf Events", "Stand Up Paddle Surf in da News"
Wow oh wow WOM...gossip. Seems like there has been some gum flappin' at the knitting groups with a stench of conspiracy and Ben-Gay. RUMOR has it that there is established group of adult "surfers" that associate themselves with a beach called San Onofre and an "Aloha" spirit that is trying to remove the Stand Up Paddle SURF division in the upcoming SURF contest. Since this is a rumor, unconfirmed by anyone associated from this group, yet from a very reliable source, I can only presume reasons why so-called "Aloha" spirited "surfers" would do such a thing. 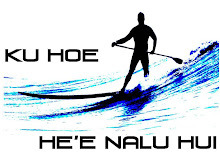 Regardless, this is a rally cry for all Stand Up Paddle SURFERS. Call, email, forward this page to everyone you know that SURFS with a Stand Up Board and a paddle and get them to register for the contest online ASAP. Unfortunately it seems that this area (San-O) is the only area in the world that doesn't recognize Stand Up Paddle SURFING as...SURFING. Again, let's help educate the local population and show our Aloha as SURFERS by participating in this event. Click here to register. This is the sport of the Kings, the sport that modern day surfing evolved into. Why wouldn't this group want a division of Stand Up Paddle Surfers and help perpetuate the history and Aloha that they cherish?